Generous use of Vermont grown organic pumpkins artfully blended with four fresh organic spices craft this seasonal treat. I reviewed that a few years ago back in the fall of 2009 under the name Wolaver's Will Stevens' Pumpkin Ale. I noticed the new label this year and the drop of the Will Stevens name so I figured it was time to re-visit this seasonal Pumpkin Ale. The beer pours a clear copper with orange hues and a white to off white head. The nose is great! 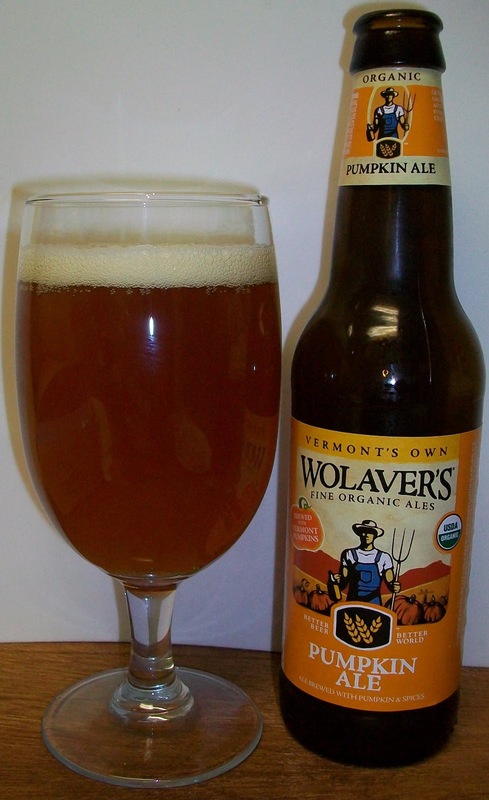 This pumpkin ale actually has real pumpkin aromas on the nose not just pumpkin spice. Ahh what nice ale; smooth and full of pumpkin and spice flavors. The experience starts with a touch of sweetness up front followed by a smooth and almost creamy mouthfeel over the tongue in the middle of the sip. The back end is very easy drinking with an effortless swallow. The finish is where this beer pulls it all together. The finish has great almost caramel malt flavors along with pumpkin and pumpkin spice flavors. The pumpkin flavors on this beer are for real not artificial. There are also some nice pumpkin spices on this beer. This may be the best real pumpkin flavored pumpkin ale on the market today. Most of the pumpkin ales that I have had should be called pumpkin spice beer because that’s mostly what you get, the spice. With this one you get real pumpkin flavor. We have warmed to almost room temperature and this beer has not picked up any off flavors. That is always impressive to me. I’m giving this wonderful natural tasting pumpkin ale an A. This may rival Post Road as my new gold standard for the style.